Ironically, Brother Roloff used to preach in chapel to the students at Bob Jones University. Contrary to BJU's claims that they haven't changed since they first opened their college's doors in 1927, THEY HAVE CHANGED, horribly so, by not taking a stand against the Devil changing the Word of God!!! That's a good statement! Our churches are filled with people today who park their rear-end in 18 inches of pew three times a week, put a few dollars into an offering plate, and sing “Holy, Holy, Holy” each week, but they are worshipping God “IN VAIN” (as our text passage says) by using, promoting and selling the Devil's Alexandrian Bible versions. By “Alexandrian” I am referring to the corrupt Greek manuscripts (Sinaiticus and Vaticanus) which originated out of Alexandria, Egypt. These corrupt manuscripts were popularized in 1881 by two unsaved Anglican ministers, both members of the occult, named Brooke Westcott (1825-1901) and Fenton Hort (1828-1892). Leading the way in apostasy, promoting these corrupt Alexandrian manuscripts is Bob Jones University (BJU). I'm talking about the apostate Harvest Baptist Church on Guam, who horribly called Dr. Jack Hyles and me “a cult” for exposing the Alexandrian Bible perversions. Pastor John Lewis founded the church in 1975 and it was thankfully at that time, King James Bible only. Today, under new pastors since around 2000, it is a house of confusion, with umpteen Bible versions circulating in the pews. The church officially uses two Bibles: the Easy-To-Read Version (ERV) to misinterpret the King James Bible. Satanic ERV Says It Is hard To Enter Into The Kingdom Of God! The human race is so foolish. I love science fiction. I remember seeing an episode of The Outer Limits (for a dose of reality), where aliens were trying to share their knowledge with humanity to benefit mankind. The stupid humans attacked the aliens instead, assuming without provocation that they were enemies. The same scenario happened in the popular film, The Day The Earth Stood Still. Tragically, these films are so true, depicting our stupid mentality as human beings. I mean, look at how corrupt the modern Bible versions are, and how dumb churches foolishly support, sell, use and further them! When I attended Harvest Baptist Church for a year in 2014, at first I was made to feel loved and I hadn't been so happy in many years. I thought, “Great, I have a church family to love and be loved”; but that didn't last! I had made the fatal mistake (in their eyes) of prioritizing caring about THE TRUTH over making friends and going along to get along. I trusted that the Lord would guide me, since He is the One Who commands us “having done all, to stand” (Ephesians 6:12); and also “that ye should earnestly contend for the faith which was once delivered unto the saints” (Jude 1:3). For kindly expressing my opinions (to help others) about the modern corrupt Bible versions, I was driven from HBC with censure, and abandoned, forgotten about completely. Today while I was walking early in the morning, I saw a woman playing in the park with her dog. The dog looked happy. I thought to myself, “Isn't it a shame that most people care more about their dog, than many professed Christians do about their own brother in the Lord?” Sadly, it is true! I was very lonely and in 2017 requested permission to come back, needing a church family, but I was coldly told by the senior pastor to “go elsewhere”! This is an ongoing battle between the Hyles-Anderson College camp (from which I graduated in 1993, when HAC still taught that the King James Bible is “inspired” as Dr. Jack Hyles believed and taught), and the apostate Bob Jones University camp today (who sanction hundreds of English Bible versions, while deceitfully claiming they merely prefer the King James Bible). Folks, the man with two watches never knows what time it is! God authored ONE BOOK, not two, not 900! It is interesting how this has all played out since 2014 when Harvest got rid of me. I had NEVER heard Dr. Jack Hyles' 1994 sermon titled, “THE BATTLE OF THE AGES” until May of 2016. The sermon didn't exist on the internet. I found the sermon in an old box of cassettes which had been sitting around for decades (which I had been lugging around from place to place as I moved). I used to subscribe to Dr. Hyles' sermon of the week cassette mail-order service, but to be truthful, I just tossed them into a box and stopped listening to them. I never imagined that one day those old sermons in a worn old box, would become so precious and have such a profound impact in my life in 2016 and today. THE BATTLE OF THE AGES is the most encouraging sermon I have heard in decades! Thank you Brother Hyles!!! I converted the cassette into an MP3 using Mixcraft software on my computer, and now it is readily available on the internet for others. I also hadn't realized that Dr. Peter Ruckman (1921-2016) fought the SAME EXACT battle I am fighting today, against The Alexandrian Cult. Bob Jones University And The Alexandrian Cult Exposed! (PDF, Dr. Ruckman exposes them all). The most effective LIE is the HALF-TRUTH, because in part it can be defended with incontestable logic! For example: The official 9/11 story (concerning the New York World Trade Center attacks in 2001) is a half-truth! The part that is true is that two planes were deliberately crashed into buildings 1 and 2. The part that is false is that those planes caused the buildings to crumble to the ground. In truth (as dozens of firefighters at Ground Zero later testified), is that buildings 1, 2 and 7 were all brought down by BOMBS in the buildings!!! A demolition company (that younger brother Marvin Bush administrated) planted those explosives in the months prior to 9-11. The truth is that 911 WAS AN INSIDE JOB!!! Likewise, the modern Bible versions are a HALF-TRUTH! The part that is true is that many Scripture passages have been made easier to understand (that is, the ones which haven't been horribly corrupted). The part that is false is the corruption of hundreds of key Scripture passages concerning Christ's deity, character and preeminence (i.e., the doctrine of Christ). Since some passages are made simpler for the reader to comprehend (especially bilingual speaking people), they buy into the HALF-TRUTH. The truthful part of the half-truth (i.e., that some Bible verses are made easier to understand), can be defended with incontestable logic. Who can argue with that logic? This is how Bible college professors, evangelists and church pastors are woefully deceived by Satan! The deadly LIE is that the Gospel has been corrupted—because the meaning of repentance has been corrupted, and because the way of salvation has been corrupted, Christ's deity has been corrupted, the blood has been corrupted, the Godhead has been corrupted—All in the modern Alexandrian-based Bible PERversions!!! If you have an NIV, ERV, ESV, NASB, RSV, NKJV, HCSB, LB, or some other modern polluted translation, you have a HALF-TRUTH (which is the most effective lie Satan has to offer, because it sells)!!! Thankfully, Dr. Peter S. Ruckman fought against the same exact Bob Jones University camp that I am today! I had no idea of the magnitude of this battle until Harvest Baptist Church (all BJU graduates) forced the issue on me in 2014. I hadn't a clue! What they meant for evil, God meant for good (Genesis 50:20). I am not kidding, and you couldn't make this stuff up, Harvest's slogan for the year (with a big banner hanging up in the church auditorium for the entire year I was there) read, “God meant it for good - Genesis 50:20.” I cannot help but see the humor in all this. God is so amazing! I love the folks at Harvest, truly, so much, and I care about people; but they really deserve the knuckleheads of the year award over there! It came as an encouraging surprise to me to learn that Dr. Ruckman had paved the way before me to fight this very same noble battle over the inspiration of the Word of God. THERE IS NOT A MORE WORTHY FIGHT TODAY! I am a soldier for the Lord Jesus Christ. 2nd Timothy 2:3-4, “Thou therefore endure hardness, as a good soldier of Jesus Christ. No man that warreth entangleth himself with the affairs of this life; that he may please him who hath chosen him to be a soldier.” My wife divorced me in 2006 against my will. That's okay, I'll live alone and serve God by myself. I underwent two major neck surgeries in 2010 and 2011 with no one by my side. I wanted to die, but God's love kept me going. I wanted to do what Ben Fieldhouse did, but thankfully didn't. Ben Fieldhouse was a member of HBC who went and commit suicide in 2010 (about the same time I almost did too). Harvest Baptist Church kicked me out and refused to let me return. That's okay, I'll be lonely and have no social life, but I WILL STAND FOR THE TRUTH!!! I'll continue to stand alone, living alone if that is God's will for me, but I WILL STAND!!! The Biggest Threat to Churches Today is Indifferent Pastors! One idiot Baptist pastor (a graduate of Dr. Ron Comfort's Ambassador Bible College) wrongly degraded me, saying, “You are obsessed with the Bible issue!” You better believe I am buster! And I'm not going to get unobsessed anytime in this life!!! If you're not upset, you're not paying attention!!! Only a man who is woefully ignorant of “the issue” would criticize someone for making a fuss over the Bible version issue. To no surprise, that same idiot pastor admitted to me that he doesn't know even one thing wrong with the modern Bible versions (because he doesn't care enough to go look). Consequently, without any ground for doing so, he criticized me for having a zeal for THE TRUTH! You see, his priorities are wrong; he prioritizes church growth over THE TRUTH!!! That same dumb-dumb pastor, openly bids Godspeed to other wicked churches who are using the modern Bible versions! Clearly, he is merely playing church as a game (for a paycheck), rather than contending for the Christian faith as a soldier. I feel sorry for the victims in his church (it's not God's church), who are being kept in ignorance by their woefully ignorant AND SINFULLY PROUD pastor. Somebody's got to care about the purity of the Word of God!!! I CARE!!!!!!! Over 95% of churches and pastors today are woefully indifferent, and they love it that way! Jeremiah 5:31, “The prophets prophesy falsely, and the priests bear rule by their means; and my people love to have it so: and what will ye do in the end thereof?” God will not accept all their stupid, lame and wicked excuses for disregarding THE TRUTH on Judgment Day! Like Hyles-Anderson College and the deteriorated First Baptist Church of Hammond, Indiana, today (who no longer preach against the Devil's Bible versions), pastors all across America are dropping the ball for God, going A.W.O.L. from “THE BATTLES OF THE AGES” (as Dr. Hyles rightly called it). Does anybody care anymore? I DO! I CARE!!! Ezekiel 22:30, “And I sought for a man among them, that should make up the hedge, and stand in the gap before me for the land, that I should not destroy it: but I found none.” Dr. Hyles Expresses Concern Over The Spiritual Future Of FBCH When He Goes To Heaven!!! God wants us hot or cold, on or off, in or out!!! God wants us to go that extra mile and do the 25% that most won't do. Matthew 23:23, “Woe unto you, scribes and Pharisees, hypocrites! for ye pay tithe of mint and anise and cummin, and have omitted the weightier matters of the law, judgment, mercy, and faith: these ought ye to have done, and not to leave the other undone.” It's not my place to judge or condemn HBC, and I am not doing that; however, it is my place to contend for the faith, “For there are many unruly and vain talkers and deceivers, specially they of the circumcision: Whose mouths must be stopped, who subvert whole houses, teaching things which they ought not, for filthy lucre's sake.” Please don't miss the important meaning of the phrase “THEY OF THE CIRCUMCISION.” That refers to false prophets who ADDED getting circumcised as a required to be saved. Harvest Baptist Church promotes and passes out materials by Dr. John MacArthur, Mr. Lordship Salvation himself. Mr. MacArthur is a former student of BJU, which explains why Harvest's pastors (all BJU graduates) fully support and promote John MacArthur and his doctrinal poison!!! Something that bothers God immensely are churches that merely go through the motions (like HBC on Guam). We see this evidenced in the seven churches of Asia Minor. Revelation 3:1, “And unto the angel of the church in Sardis write; These things saith he that hath the seven Spirits of God, and the seven stars; I know thy works, that thou hast a name that thou livest, and art dead.” Sadly, most churches today fall woefully short of what they are supposed to be. The tragic thing is not that our churches are imperfect; but that they don't want to be perfect and are complacent in their backslidden, apostate and woeful sinful condition. Indifference is a horrible sin like murder, adultery and fraud. Harvest's pastors are so far from God that they called me and Dr. Jack Hyles “a cult,” simply for exposing the Alexandrian Bible perversions. They called me their “enemy.” They said it, not me! In fact, they are God's enemies, but are too proud and blinded to see THE TRUTH. They might as well also believe that the earth is flat at Harvest Baptist Church and Bob Jones University (maybe they do). Look for yourself and see how corrupt the modern Bible perversions are! THIS IS A SERIOUS MATTER FOLKS, or else I wouldn't make such a big fuss!!! I say that humbly and kindly. I make no apologies for contending for the Christian faith!!! When I get forced out of my church family, and they discard me like an old shoe, and couldn't care less about me as a human being, because I AM TELLING THE TRUTH, doggone it, I am going to SPEAK UP!!! And I'll never shut up until God tells me too! And may I kindly say, the BIG PROBLEM with Christians today is that we DON'T SPEAK UP! I'm tired of seeing pastors trying to do God's work with the wrong tools (i.e., the Devil's Bible versions and Calvinism). That's like an auto-mechanic trying to fix your car with kitchen appliances! That's like a plumber showing up at your home to repair your leaking pipes with fishing gear! If it is considered by some to be “unethical” to criticize corrupt churches by name, then brother I'll be unethical. I would 10,000 times rather be right in my position and wrong in my disposition, then to be wrong in my position and right in my disposition. And if you think John MacArthur, Paul Washer and Ray Comfort are men of God, like Harvest does, I suggest you go watch some episodes of “The Outer Limits” for a dose of reality! Ray Comfort Hinders This Woman From Being Saved, By Pressuring Her To Stop Her Sinning!!! (that is NOT the Gospel of free grace, and that is NOT what it means “to repent”). The churches ought to be refuting and exposing false prophets like John MacArthur, not idolizing and promoting him! Granted, Mr. MacArthur DOES have some brilliant theological insights, even admirable; but he is WRONG on the plan of salvation, wrong on repentance, wrong on the Gospel, which makes him of the Devil. Kindly, I AM 100% RIGHT DOCTRINALLY AND TO TAKE A BIBLICAL STAND and I am staking my heavenly rewards on it! If am am right—that Harvest Baptist Church is indeed promoting an unsaved heretic (John MacArthur), and that they are promoting the satanic heresy of Lordship Salvation (Calvinism), and that they are promoting Satan's New World Order Bible perversions (they use the ERV), then I know it won't go well for them on Judgment Day!!! I say this with all love, respect and kindness for the churches. Who am I, but a redeemed sinner, cleansed by the precious blood of Jesus Christ? I don't appeal to their senses anymore at Harvest Baptist Church, so they don't want me. I feel like Rudolph the Red-nosed Reindeer often, who was ostracized from the group for merely being different. I am just a nobody, a sinner saved by grace, a Christian with a big red King James Bible glowing nose (like Rudolph), and a human being who treats others the way I want to be treated (Matthew 7:12). Unfortunately, Harvest's staff and pastors are respecters of persons (James 2:1), selectively caring about whom they so choose, which I think is terrible. I love everybody with God's unconditional love, no matter what! That is Christ's love; not the snobby, highbrow, cliquish, yuppie, heathen mentality of the BJU camp! Christians sure don't act much like “Christians” these days. Furthermore, they have their priorities wrong at Bob Jones University and Harvest Baptist Church. I see hundreds of kids in local stores wearing “Harvest Baptist Academy” t-shirts, with dozens of local businesses listed, who support the religious school. I'd prefer to see something else on the t-shirts like, “Harvest Baptist Academy - John 3:16” or “Harvest Baptist Academy - Jesus is the way!” Nope, it's a list of secular businesses who endorse them. I see a problem with that. Since Harvest Baptist Church openly advertises their “ministry” in stores and in our faces on Guam, I am going to refute what they are doing, because it is wrong in my Christian opinion. Luke 16:13, “No servant can serve two masters: for either he will hate the one, and love the other; or else he will hold to the one, and despise the other. Ye cannot serve God and mammon.” Why have all your 1,000 students from Harvest Baptist Academy walking around advertising businesses instead of the Gospel? Like I said, THEIR PRIORITIES ARE WRONG!!! When I go to the beach parks on Guam, I see cars with windshield sun-protectors which advertise “Harvest Baptist Academy.” In your face! How do you think that makes me feel, when HBC has banned me from returning to attend church services, simply because I TOLD THE TRUTH about the Devil's modern Alexandrian-based Bible perversions? I was being a friend to those pastors, as Evangelist Tom Ferrell said at Harvest while visiting the island a few years ago, and I quote: “A FRIEND HELPS A FRIEND TO SEE!” How ironic! They don't want to see!!! Bob Jones University and HBC prioritize music—cantatas, teaching youth how to play a musical instrument, singing, pennywhistles, music programs, sports and intramural sport's competition, et cetera—but the preaching of God's Word doesn't even come in a distant second. I literally heard the senior pastor of Harvest, in my 6-week “Foundations Class” while joining their church, say, “You can probably find better preaching elsewhere, but our music program is second to none!” That is a crying shame! With such a lackadaisical attitude toward the importance of preaching, should it be surprising that HBC officially uses TWO conflicting Bibles (KJB and ERV), has TWO plans of salvation (Calvinism and the free grace Gospel) in its midst and is indifferent? Officially, the church teaches Lordship Salvation (as heard with my own two ears). I went home and cried. However, from witnessing to some church members and staff, they DO have some believers there. One HBC staff member told me that admitting you're a sinner and believing the Gospel is NOT enough to be saved, he said, and I quote: “There needs to be a little more!” (he was referring to a mandatory sincere desire to turn away from one's sins, which is deadly false repentance). Remember, Judas “repented himself” of his sins in Matthew 27:3, but still went straight to Hell to burn forever!!! Reformation is not regeneration! Harvest Baptist Church is a house divided of sorts. That is where I erred in my thinking when I began attending in 2014. I figured I had a right to my opinion and would just be myself; but when the pastors tried to shut me up about the modern corrupt Bible versions, then I felt like I was in communist North Korea. Ironically, the founder of HBC, Pastor John Lewis, is a Vietnam vet. It is a shame that the truth is banned from most churches today, as it is today in North Korea, Cuba, Russia, China and other oppressive regimes. Again, ironically, I heard on Harvest's local radio station (KHMG 88.1 FM) the following excellent truth, “Satan wants us to SHUT UP, but God wants us to SPEAK UP!” Okay, so does that make the church pastors at Harvest the Devil? I didn't say it, their own radio station did! The told me to SHUT UP about the New International Version (NIV) being the Antichrist's Bible! All of the Alexandrian Bible versions are spiritually DEAD! Brother Roloff is so right! Harvest's Easy-To-Read Version (ERV) parallel Bible that they use and sell is dead! Dr. Jack Hyles said that nothing is destroying churches today like businessmen, because they prioritize money instead of truth. That is what has happened to the First Baptist Church of Hammond. A half dozen apostate men came in and changed the place, so that now they no longer believe that we have an inspired Holy Bible today. I am sick and tired of the love of money in the Bible colleges and churches today. I have never made one penny and never will for serving God. I am not against a pastor getting paid. Even the Bible says a preacher ought to live off the Gospel (1st Corinthians 9:14); but that doesn't mean prosper off the Gospel or turn God's work into a business. When I see Ray Comfort paying himself a 6-digit salary, and his family even more, I see a wolf in sheep's clothing. Henry Morris III and his family too, paying themselves 6-digit salaries for refuting evolution. It is sickening! “Every change to the NIV must be thoroughly vetted — and changing the text isn’t easy. In order to become part of the NIV, a change must receive the support of at least 70 percent of the translation team. Such a high threshold among a denominationally diverse team of scholars helps to protect the NIV from agendas, bias, and outside influence — ensuring that any changes are backed by the very best biblical scholarship. What you've just read is a big bunch of bullcrap! What Biblica will never tell you is that their NIV is based upon the Alexandrian, Egypt, manuscripts (allegedly older and more reliable than our beloved Textus Receptus from which the King James Bible was translated). The manuscripts for the Textus Receptus originated in Antioch, Syria. The King James translators were challenged with having to sift through literally thousands of ancient manuscripts, trying to decide which ones were authored by God, and which ones were manmade to deceive people. The King James Bible translators noticed that the majority of the manuscripts agreed, which become known as the “Majority Text” (or the “Received Text,” aka, Textus Receptus), and they recognized that God had safeguarded His Words in the majority of the manuscripts. The stray dogs (clearly manmade deceptions) were rejected. The NIV is based upon some stray dog manuscripts!!! So you see, you really cannot trust your NIV as Biblica claims! If you'll take the time to compare Bible translations, you'll find that the NIV savagely attacks the doctrines of the deity of Jesus Christ and the Godhead. The word “Godhead” is completely removed in Acts 17:29, Romans 1:20 and Colossians 2:9, which is every passage in the Bible mentioning the word). Instead they call God the “divine nature,” which is exactly what the Antichrist is going to worship, that is, “the God of forces” (Daniel 11:38). New Age portrays God as an energy force permeating the universe, the god force within us, teaching that all men can attain personal godhood through occult enlightenment (such as Kaballah, Freemasonry, Mormonism, Rosicrucianism, et cetera). In reality, these satanic deceptions are a substitute for the Gospel of the Lord Jesus Christ! Please read, Occult Roots Of The Modern Bible Versions. If your pastor(s) don't care about this issue and prefer rather to continue using a occult inspired fake translation, then you seriously need to get out of that place and go find a legitimate local New Testament Church that hasn't been corrupted and deceived. The Holy Bible is our spiritual food and meat, and if that food supply becomes tainted and poisoned, then you're going to get spiritual food poisoning. Our churches today are absolutely overrun with sick saints and spiritual miscarriages who never got saved at all, because of the damnable influence of the lie of these so-called “easy-to-read” Bible versions!!! Jumping out of an airplane without a parachute will help get you to the ground faster, but at what expense? As is typical with the Devil, he has once again cleverly hidden a lie between two truths to deceive people. TRUTH: The newer Bible versions are easier to read. TRUTH: There were over 100 so-called “experts” involved. LIE: You can trust the NIV. If you'll take a look back to the earlier quote I provided from Biblica, you'll notice that they invited representatives from umpteen different religious denominations to get involved with butchering God's Word. They claim the reason was to prevent sectarian bias (religious prejudice), but I say the real reason was to increase the marketability of the NIV. 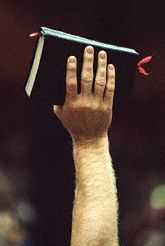 In the 2011 NIV, Biblica have changed the content of their Bible version 38.8% as compared to the 1984 NIV!!! Yet, Biblica claims (in the quote I gave you earlier) that it is not easy to change their Bible version. What a sham! It sure seems easy from the statistics! Has God's Word changed that much in 30 years? No, not at all, but American society has changed 38.8% over the past 30 years, becoming queer as can be, which is why the NIV has turned their Bible version into a religious lesbian's feminist dream come true. You can identify today's spiritually lifeless churches by the lack of hard-preaching from the pulpit. You can spot these lukewarm churches by the woeful absence of aggressively contending for the faith. Brother, if people don't think you're crazy, you're not living right for God. Most churches today have spiritually malnourished members. Good luck finding a soul-winning program of any sort. You likely won't hear any preaching that warns sinners of imminent Hell, fire and damnation. We've got a bunch of wimpy churches today!!! Listen, you're not a success in God's eyes just because you go through the motions at church each week. God is far more pleased with a Christian who doesn't attend church in disgust over today's apostate churches (knowing that his life falls short of pleasing God); than God is with some apostate church member who is at ease on Zion, complacent in the pew, playing church three times a week, never lifting a finger to do anything for God (who thinks he is doing just fine in God's eyes!!!). Many of you need to stop kidding yourself. The man with no hope is better off than the man with a false hope, because the man without hope is still looking. The same is true of a Christian whose out of church, but knows that he or she needs to find a good church to attend. God is far more pleased with this person than He is with the lukewarm believer who faithfully attends a lukewarm church and never does anything for Christ. And may I say, I am so sick and disgusted with churches who think that they've done something for God just because they donate school packs to poor kids once a year. That's a nice good work to do, but what about having a soul-winning program??? There's nothing worse than seeing hundreds of staff members, teachers and full-time church workers in a church congregation who are obligated to attend church services that are boring, dry, dead and lack hard-preaching! Kids are playing video games. Parents are surfing the internet. All during church!!! The staff are spiritually starving for doctrine. I've seen it in independent Baptist churches. This is religion, not Christianity. No church can be pleasing to God with a dead preacher behind the pulpit. The pastor sets the tone in the church. A loving and morally upright pastor cannot compensate for a lack of doctrinal integrity, a lack of contending for the faith, a lack of preaching against sin, a lack of soul-winning, a lack of warning lost sinners of hell-fire and eternal punishment, a lack of preaching against women wearing pants, a lack of teaching about the power of the Holy Spirit, et cetera. Truly, a lot of pastors don't belong behind the pulpit. Do it right or don't waste your time doing it at all. BJU and Harvest Baptist Church DON'T care about the truth. By the way, I expose the First Baptist Church of Dallas, Texas, too, so it's not personal. If the issue weren't over the purity of God's Word and the clarity of the Gospel, I wouldn't even waste my time to make a fuss. Albeit, as a Christian I am commanded to refute (Greek: elencho, “to expose”) the “UNFRUITFUL WORKS OF DARKNESS” (Ephesians 5:11). The modern Bible versions are fruitless! They produces spiritual miscarriages!!! Many churches today fail to seek the power of the Holy Spirit, fail to preach the Gospel (instead they teach the satanic heresy of Lordship Salvation), fail to preach against sin, fail to love sinners, fail to warn lost sinners about a burning Hell where Christ-rejecting sinners will suffer for eternity, fail to care about doctrinal correctness, and fail to even use an uncorrupted translation of the Holy Bible (if you ain't got a King James Bible, you don't have a Holy Bible). What's in your church? Jesus said that the entire purpose for which He came into the world was to bear witness unto the truth. John 18:37, “Pilate therefore said unto him, Art thou a king then? Jesus answered, Thou sayest that I am a king. To this end was I born, and for this cause came I into the world, that I should bear witness unto the truth. Every one that is of the truth heareth my voice.” The truth is important. Satan's only real power is at hiding the truth, through cleverly fabricated deceptions and religious lies. Satan has filled the world with the lies of religion, the lies of evolution, the lies of Hollywood, the lies of secular philosophy, et cetera. The best defense against Satan's lies is the truth of God's Holy Word. Kindly, I cannot sit under any pastor who allows, uses and refuses to expose the modern corrupt versions of the Bible. Satanic occultists Brooke Westcott and Fenton Hort corrupted the Word of God, deliberately to deceive the churches. The evidence is readily available for research. Tragically, most preachers just don't care. Our churches are being deceived. The most important thing in any Christian's life should be THE TRUTH!!! Sadly, it seems that the truth is the last thing that matters to churches these days. This is evidenced by the widespread teaching of the false plan of salvation of Lordship Salvation. This is evidenced by the corrupted Bible versions which have been embraced whole-heartedly by most churches today. This is evidenced by the deafening silence in our churches concerning the reality, horror and eternal damnation of a burning literal Hell. This is evidenced by the heresy of Zionism in our churches (a concise one hour MP3 history of the New World Order, Zionism and apostate Christianity). The reason why pastors today lack zeal, fire and a burning passion in the pulpit in their preaching is because they don't walk with God as they should. Hebrews 10:29 says that our God is a CONSUMING FIRE!!! I have a burning passion in my heart for THE TRUTH of God's Word, for THE TRUTH in general. I must have the truth! I want the truth! I hate lies and deception! Most pastors teach the Bible as a humdrum devotional sermonette. I firmly believe that truth should be preached with fervor and excitement. Do you know why most churches are totally empty of any youth? It's because teenagers want to be a part of something worth dying for, something bigger than life, something exciting. Go attend the average church today and the truth is presented as if it were a funeral. It's as boring as can be, nothing more than a vague doctrinal statement. Brother, we need preachers again like Billy Sunday who holler the truth, throw chairs, jump up and down, run around, throw a fit at the Devil and get mad at sin!!! But you say, people might think I'm nuts. May I say, if your audience doesn't think you're nuts over truth, then you're a lousy preacher! It's OK to be a nut if you're screwed onto the right bolt! Jesus is the right bolt! We've lost the fire in our church pulpits!!! We've got a bunch of apostate religious centers these days, passing off as New Testament churches. Is there a fire burning in your heart? If not, Get right with God. Isaiah 59:14, “And judgment is turned away backward, and justice standeth afar off: for truth is fallen in the street, and equity cannot enter.” ObamaCare is not the problem these days; but rather, We Don't Care is the big problem. I care, do you?